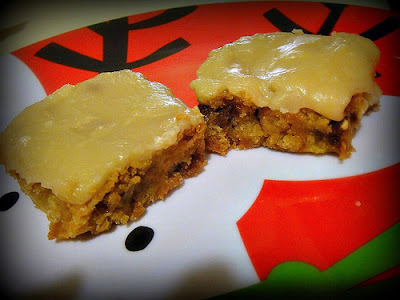 This Apple Toffee blondie was part of the “Christmas platter” entourage from a few days ago, but it needed its own post. It’s THAT good. 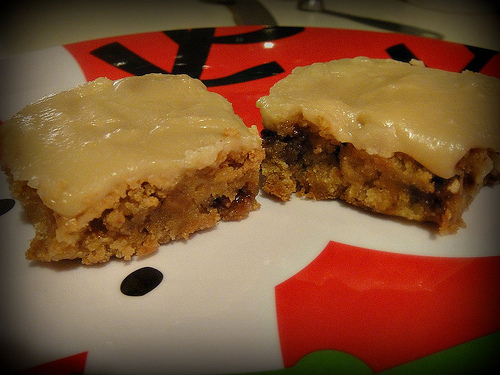 So, this is how it went down…I had already planned out what I was making for my cookie gifts. (Keep in mind I kept adding recipes to the list after I’d already gone shopping) I finally cut myself off and made a pact that I wouldn’t add anything else. UNTIL I SAW A PICTURE OF THIS BLONDIE. (Thanks a lot Pinterest) It was love at first sight. I threw caution to the wind. Ignored the fact that I might be overexerting myself by baking too many things in one day. I just HAD to make it and even more importantly, I HAD to taste it. I was patting myself on the back when I bit into this “little piece of heaven” (direct quote from my pal Dan). This blondie is positively sinful. The combination of tart green apple and sweet crunchy toffee gives the brownie such a nice taste and texture. And the brown sugar frosting? It needs no explanation. I slightly changed up the original recipe a little bit by adding in Heath Bar toffee bits (covered in chocolate) and using a bit more apple and a tiny splash of apple cider and cinnamon. 1. Preheat oven to 305 degrees. Spray a 9 X 13 pan with cooking spray. 2. Cream butter and brown sugar in electric mixer until smooth. 3. Add eggs and vanilla. Beat on medium speed until smooth. 4. On low speed, mix in flour, baking powder, salt, apple cider and cinnamon. Mix until combined. 5. Fold in the chopped apples and toffee bits until evenly distributed. 6. Spread into prepped pan and bake for 30 minutes until the center is set. 7. Cool completely before slicing or frosting. Melt butter in medium sized saucepan. Add brown sugar and milk and bring it to a boil. Once boiled, remove from heat and let sit 5 minutes. Stir in powdered sugar with a whisk. Let mixture cool so it becomes thick enough for frosting. Stir well before frosting the blondies. Spread over blondie and allow frosting to set for 30 minutes before cutting into them.